Mexico took 17 shots and attempted 12 corners as it kept the pressure on a Welsh side mostly lacking in experience at the international level. 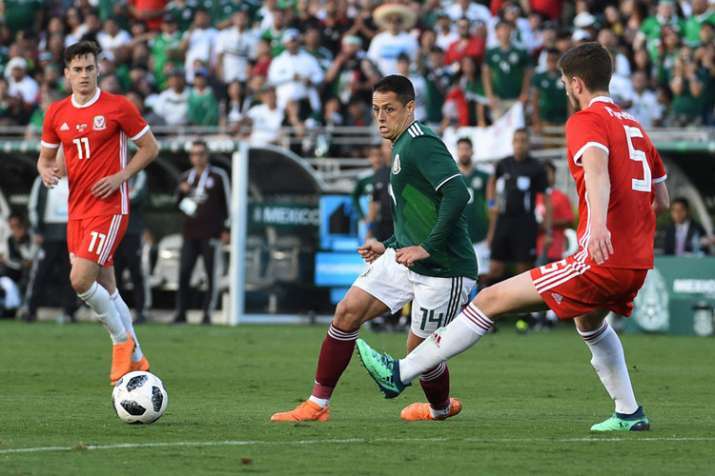 Mexico opened their World Cup preparations with a goalless draw against Wales. Mexico opened their World Cup preparations with a 0-0 draw against Wales at the Rose Bowl on Monday night, but El Tri showed they have plenty more to offer in Russia than the score might indicate. Playing the first of three tune-up matches before its Group F opener against defending champion Germany on June 17 in Moscow, a rampant Mexican attack could not find a way to beat Wales goalkeeper Wayne Hennessey. However, Mexico was just as adept in keeping the Dragons under wraps. Wales took two shots and Mexico goalkeeper Jesus Corona did not have to make a save, getting some help when Hugo Ayala made a last-ditch tackle to keep Tom Lawrence from getting his try on goal in the 8th minute. Aside from that attempt and some early jitters in the opening few minutes, Mexico's defence settled in well in their first game without Nestor Araujo, who left the team Wednesday following a setback in his recovery from a knee injury. Araujo had been practically an automatic selection for coach Juan Carlos Osorio, and his absence was exacerbated by not having Diego Reyes of Porto FC and Hector Moreno of Real Sociedad available. Osorio expects both Reyes and Moreno to be healthy enough to play against Scotland in Mexico City on Saturday. "And I'm sure if they are in the starting line, we will improve the quality in many ways and I think we will have a very strong back line," Osorio said. Mexico, which will try to advance past the round of 16 for the first time since reaching the quarterfinals when it hosted the 1986 tournament, looks to be even more confident in its attacking prowess. Hennessey made eight saves, including sticking out his right foot to deny Mexico captain Hector Herrera's shot in the 56th minute from the edge of the 6-yard box. Hennessey also tipped Herrera's shot from outside the penalty box over the crossbar in the 40th minute and parried away Javier Aquino's attempt in the 22nd minute. "Mexico made us work for a clean sheet, they made us work hard," said Wales manager Ryan Giggs, praising the organization and tenacity of El Tri as much as its individual skill. "They've got a lot of quality, and what we've seen in the buildups with the videos is a team that likes to press," Giggs said. "When they lose the ball, get it back quickly, which puts you under pressure. It's very hard to keep the ball, so a very good team." The attack looks to be strengthened with the Los Angeles-based MLS trio of brothers Giovani and Jonathan dos Santos representing the Galaxy, and Carlos Vela from expansion team Los Angeles FC. Jonathan dos Santos came on in the 61st minute, and Giovani dos Santos was a 69th-minute substitute. They finished out the game without any apparent limitations from hamstring injuries that have limited both brothers this season. Osorio set a Saturday deadline to prove their fitness and make the final roster. Vela, who did not play against Wales, should be called upon against Scotland. He has scored seven goals in 12 MLS games. All three could be especially valuable if South Korea or Sweden decide to emphasize defence and force Mexico to break them down. Though they were unable to score against Wales, Osorio believes Mexico showed they are ready for that challenge, provided they can improve their chemistry in the final third. "Any team that will drop off will present the same questions in how we are going to penetrate them, how we are going to get entries into the attacking third. It will be a major factor. It was a big challenge for us," Osorio said. "However, we penetrated them enough times to score and the goalkeeper rescued them."